NASA's latest adventure to Mars has given the world more than just glimpses of a new alien landscape. 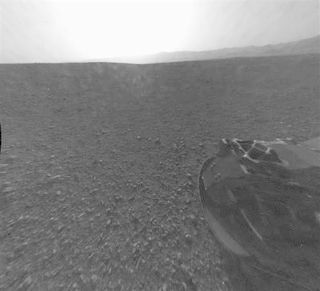 It opened a window into the trip itself, from video footage of the landing to a photo of the rover hanging by a parachute to a shot of discarded spacecraft hardware strewn across the surface. And the best views — of Mars and the journey there — are yet to come. "Spectacular," mission deputy project scientist Joy Crisp said of the footage. "We've not had that before." Since parking itself inside an ancient crater Sunday night, the Curiosity rover has delighted scientists with views of its new surroundings, including the 3-mile(4.8-kilometer)-high mountain it will drive to. It beamed back the first color picture Tuesday revealing a tan-hued, pebbly landscape and the crater rim off in the distance.